Promotional value expires 90 days after purchase. Amount paid never expires. Full dinner can be substituted for salad bar. Reservation required. Not valid on Father’s Day. Not valid on Mother’s Day. Not valid on Valentine’s Day. Not valid on New Year’s Eve. Not valid on statutory holidays or special events. Limit 2 per person, may buy 2 additional as gift(s). Valid only for option purchased. May be repurchased every 90 days. Limit 1 per table. Not valid with other offers or promotions. Merchant is solely responsible to purchasers for the care and quality of the advertised goods and services. Pampa’s dinner menu features a whopping seven different kinds of beef, all coming from different parts of the steer with varying levels of tenderness, flavor, and texture. 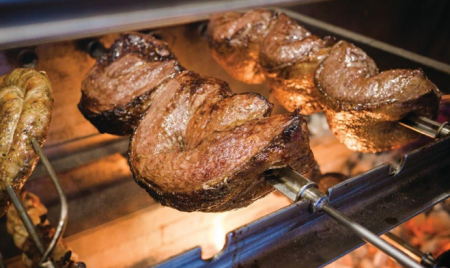 Among them, there’s the flavorful rump steak (or Picanha in Portuguese) as well as the more tender top sirloin (or Alcatra as it’s known in Brazil). And that’s just the beef—there’s also three different pork options, four chicken options, and a New Zealand leg of lamb. The tannins of Spain’s Torres Mas La Plana Cabernet Sauvignon perfectly complement slices of the marinated leg of lamb. The crispness of the VQA Fern Walk Sauvignon Blanc from the Okanagan Valley helps balance the richness of Pampa’s flavorful pork sausage. Luigi Bosca “La Linda” Malbec, a classic, medium-body Malbec from Lujan de Cuyo, Argentina goes exceptionally well with the AAA top sirloin.